This weekend we did not go camping. Phew, I think we needed a break. Plus of course, it gave me a chance to research some more campsites I want to visit. I have a spreadsheet that I add campsites to as I find them (is that very sad? ), so I thought I would share them with you. Perhaps some of you have visited them and can tell me if my hankerings are with or without reason. Also do let me know of any campsites you recommend! All these sites allow campfires. ‘Situated on Westmoor Farm in the beautiful Oxfordshire countryside, Turkey Creek is a secret retreat hidden away in a woodland setting without TV, computers or all the gismos where you can spend some ‘quality time’ with your family and friends. To be honest the website is not that inspirational there is very little info, but that almost makes it more appealing. How come they are so casual that they don’t bother adding loads of lovely photos? Is it because only special people know about it and visit it? I want to be one of those special people! Plus, a friend recommended it to me. Brithcombe Farm is also on the Swindon side of Oxfordshire. I have visited this campsite, but it was a few years ago. We had a good camp there and enjoyed the climb up to the Ridgeway and the views of the Uffington White Horse. It is a working farm and there are at least three large fields so it’s is a good one for group camping. Facilities are basic but adequate. I would love to return to see if it has retained its earthy charms! Lyme Regis and Charmouth are fabulous places to visit, I am very excited to have found this campsite so close to Charmouth. It looks like there are sea views too. Only downside is that it is only open in August. Shame. Still might just be able to fit it in! Riverside Lakes is in Wimbourne in deepest Dorset. Oh my word! This one has an island you can camp on! Clearly not accessible to my campervan but still a great feature. Campervans are restricted to a certain area which is always slightly upsetting to me but probably great for other campers. The other slightly annoying issue is that it is a ‘Camping and Caravanning Site’, but only one member of a party needs to be a member and you can join on site. Any campsite which features water heavily will always be a big lure for me. After we visited Priory Mill Farm near Brecon, I came home a little underwhelmed by the campsite but in love with the area, and started searching for other options. This is a lovely looking Brecon Beacons campsite, but, I fear no campervans – can’t believe it, more Campervan Prejudice. Sob. A very lovely looking basic site. The main attraction appears to be the views. That is good enough for me! Fires in braziers only. Black Mountains Yurts is in Mid Wales. ‘Pwllycwrw is situated in Llandefalle, one of the largest yet under-inhabited parishes of Wales. Situated in the heart of Mid Wales, our smallholding looks out with the most amazing views over the Black Mountains and the Brecon Beacons. As the name suggest this site has grown up around yurt accommodation but they also have a large camping field with only ten pitches. It looks like a very peaceful and remote area, with lovely views. The fire pit is a large communal one. Not just waterfalls but a river area good for kids and ropeswings. Hurrah! This area of Wales is so beautiful, also near to the beach at Shell Island. (There is an enormous campsite at Shell Island which used to have a great reputation for wild camping but I fear can suffer from loud and large groups, I haven’t been there but this is what I have heard!). Probably not the quietest campsite but in great location and brilliant for kids. South Penquite Farm is high on Bodmin moor in Cornwall. I love camping on a wild moor, this looks very good, set on a working organic beef farm, with all of Bodmin at the gate. There is a lot going on at the farm including Bushcraft courses – excellent! ‘We offer you a small, eco-friendly campsite, spread over three different locations around the farm. There is a good amount of space between the tents. This site has a very hippy feel to it, the organic farm was originally a commune, now with camping, yurts etc. Walk to beach through the woods! Music to my ears! Lower Penderleath Farm is nr St Ives, Cornwall. I have been researching campsites for a tour of Cornwall this year, this looks good. 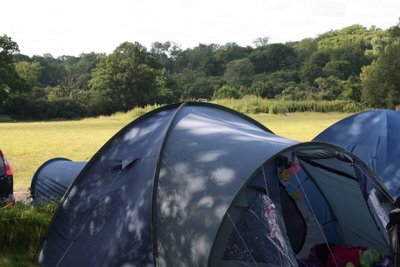 The website is very brief but reviews on UK campsite are positive. Sounds like it doesn’t get crowded in the summer and there is a communal fire or fire buckets to hire. Also it is close to St Ives, somewhere I’ve never visited but would very much like to. I have more. But that’s enough for now I think. Do let me know of any great campsites you recommend, or of course any to avoid! Am liking the look of Brigs farm – we love it down on that Jurassic coast. Do they allow camper vans, do you know?